Long before the out-of-touch, modern metal suckups at Metal Hammer coined the term New Wave of Traditional Heavy Metal (NWOTHM), bands like 3 Inches of Blood have been reviving the best of early heavy and thrash metal for last 5 years or more. Here Waits Thy Doom, 3IOB's fourth studio album only assures the band's reputation as one of the best representatives of the trend. Even now they are being copied by other bands (see my review of American's Razor Fist). Even better is that Here Waits Thy Doom is much more accessible and entertaining than previous works. On earlier works 3IOB attempted to integrate modern metal nuances with growling vocals and harsh compositions while still holding on classic thrash and heavy metal. Generally it worked. But after so many songs vocalist Cam Pipes became monotonous and grating, and the growling backups predictable. This time around, on Here Waits Thy Doom, Cam lightens up a little (very little) on the screaming attempting more melodic vocals (and the harsh vocals aren't so harsh). He succeeds, but inevitably becomes monotonous and predictable once more. Thankfully, 3 Inches of Blood abandons much of the harsh modern metal motif and applies the great classic melodies of their forerunners without losing any intensity. Here Waits Thy Doom sounds more like early Maiden-like NWOBHM (without mere duplicating them) than ever before. Highlights include Battles and Brotherhood, Rock In Hell, Fierce Defender, Call of the Hammer, and the quite clever Preacher's Daughter. 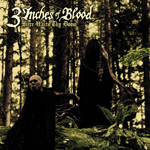 3 Inches of Blood has turned a corner with their latest Here Waits Thy Doom. They have abandoned the much of the harsh modern metal nuances found on earlier works for the greater and epic melodic sensibilities of their heavy and thrash metal forefathers. And its all good (even if you have to endure more of Cam Pipes' monotony).